Although he had drink taken a 23-year-old man decided to drive to get his girlfriend’s car and this led to him getting an 18 month ban from the roads. Christopher McCandless, Old School Court, Dromara, was fined £200 and banned for 18 months last Thursday at Banbridge Magistrates Court for driving with excess alcohol on August 1 this year. Fines of £100 and concurrent 12 month disqualifications were imposed for driving without insurance and not having a licence. The court heard that at 12.20am a police mobile patrol in Dromore noticed a car being driven at speed through the town and then to Beech Grove. They spoke to the defendant and there was a smell of intoxicating liquor on his breath. McCandless admitted he had been drinking and that he did not have insurance or a licence. A breath test gave a reading of 50. A solicitor representing the defendant said he made the foolish decision to go and collect his girlfriend’s car. She explained that the girlfriend car been in the centre of Dromore a few weeks previously and some damage had been caused to it. 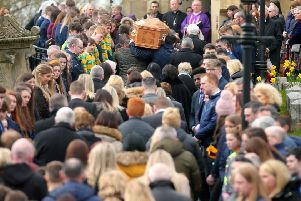 The solicitor said the girlfriend had taken the car into town this night and McCandless had walked a quarter of a mile into Dromore to collect it.